After many years 15 years of using durock, wonderboard, permabase, and hardi, we are considering a "new" method. We do a lot of bathrooms. We do a lot of 12x24, 8x36, and etc large format tile. When the subfloor is sound 3/4" plywood with 16 OC joists, we are thinking of applying a synthetic mesh to sub floor and pouring a leveling compound over the entire surface to a minimum depth of 1/4" to achieve a perfectly flat and level substrate in which to set larger format tile...in lieu of a screwed and mortared substrate. Anyone doing this, have done this, etc? Thoughts and recommendations welcome. While I haven’t used it, there’s been a fair amount of talk about Ardex Liquid Backerboard that piques my interest...and it doesn’t require mesh. Yes!!! I hardly get to float a floor with deck mud because of height restrictions, this is the next best thing to mud floors. My uncle taught me his self leveling method for wood floors which stands on its own (even over wood plank subfloors). Caulk all finestrations, joints, cracks and seams anything that poses a leak, and then prime the floor. Then take 2.5# diamond lath and nail it down with roofing nails, put down another row of lath down with the sheets oriented perpendicular to the first row. Put any temporary barriers in place for registers, doorways, waste/water lines. Pour your favorite leveler out, any leaks dash out some dry powder to stop them. The two rows of lath stack out to about 3/8”. This makes for a solid floor and a great substrate, it’s not deck mud but it’s not that bad either. As Gauged Porcelain Panels have become more popular and tile has grown in general, we have seen many installers making the switch the levelers in place of other substrates. We have been highlighting surface prep in our webinars and educational events for tile installers. I would be careful about levelers that state you can use them without primers, a good primer will pay for itself the first time you avoid a callback for a hollow floor. Better yet would be to use lath. We have a product called Mapelath designed specifically for tile installations with leveler like our Novoplan Easy. Hit up your MAPEI sales rep for more info. I've used Liquid BackerBoard on two of my properties with success. I've not used the Mapei products yet. So this is basically self leveling compound correct,or is it something else ? Another vote for the Ardex Liquid Backerboard. 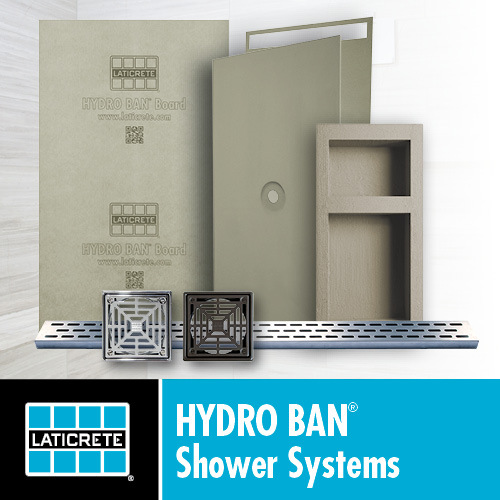 It is a self leveler that doesn't require lath reinforcement. I have used it a couple of times where I don't have enough room for metal lath required for traditional SLC's as it flows down to about 1/8" or so. The Ardex requires a primer and seems to bond extremely well to plywood. Note, no matter how well you think it is sealed, there will probably still be a leak somewhere. I still use Ditra to bring up the floor to the final proper height to match the existing floor. Ditra is a bit more economical than Ardex Liquid Backerboard. Also, I feel Ditra gives me some insurance against cracking. Custom has a new product called WSF which is similar to LBB but it's a 1/4 inch minimum. I haven't tried it though. Custom WSF is an excellent product @ half the cost of Liquidbacker in my area. I have no complaints on usage. Use The Ardex LBB with Flextherms Snap system for electric radiant heat. Love the stuff. Great for mosaic work with heat.